Custom printed hoodies, while seasonal, have come a long way. Every company is now making hooded sweatshirts, or “hoodie” as they are so commonly called. You have heavy weight, light weight, performance poly moisture wicking hoodies, female hoodies, triblend hoodies, hoodies with piping, accents, and two tones. There are so many options where do you begin to choose the right hoodie for your logo wear? Most of what we screen print for customers are the basic hoodies. They provide the look and feel they want at a price point that is affordable. We print more light weight hoodies compared to heavy weight by a ration of around 20 to 1. Whether they are performing outside labor, inside a hip environment, or just to casually be about town with their logo wear, most customers choose the lighter hoodie. The reason is simply, they are light enough to be worn inside and those working outside tend to layer anyway so they don’t have something too heavy that makes then hot really quickly. If they catch a nice day they can simply take the hoodie off or take off an under layer and keep the hoodie on and remain comofortable. Most custom printed hoodies will fall into the basic or traditional hoodie line. Basic hoodies give customers the most color options and they come in youth and female styles as well. You can’t go wrong with the traditional custom printed hoodie. All other hoodies will fall in the fashion category. These would be your ultra weight 3 season full zip hoodies, your 100% poly performance moisture wicking hoodie, tie-dye and camo hoodies, and hoodies with accent colors or contrast piping. The fashion hoodie is in the minority but companies and events have done good things with them. Since they don’t have the traditional look they tend to stand out more which is great for branding. The non traditional look is very eye catching. The performance hoodies are popular among team sports. They come in a variety of school colors and have a nice sleek look to them. They are great custom printed hoodies for various teams in all sports. 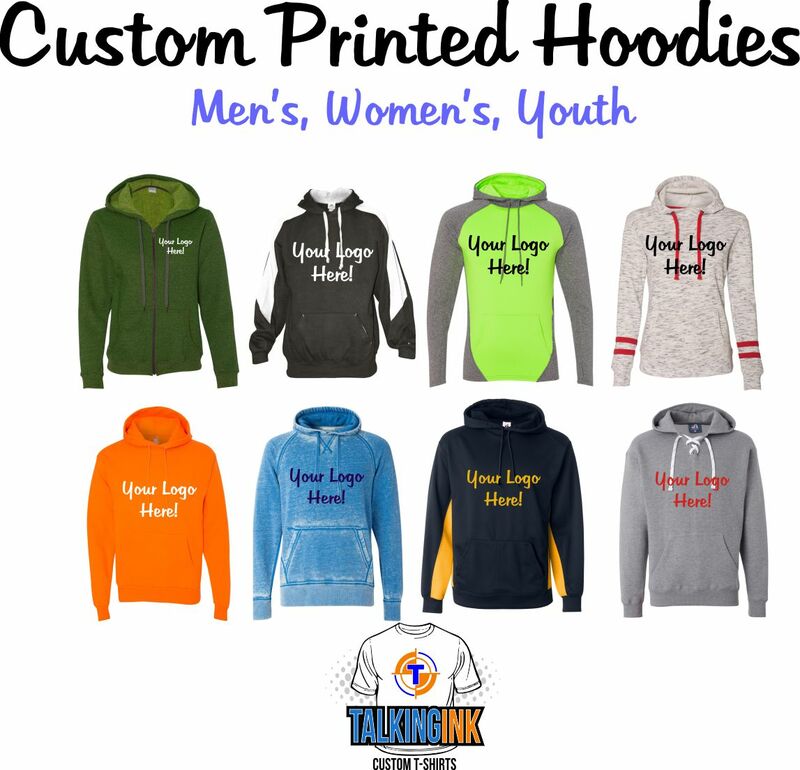 If you are in the market for custom printed hoodies give us a call and we can see what your specific needs are the discuss the best options.